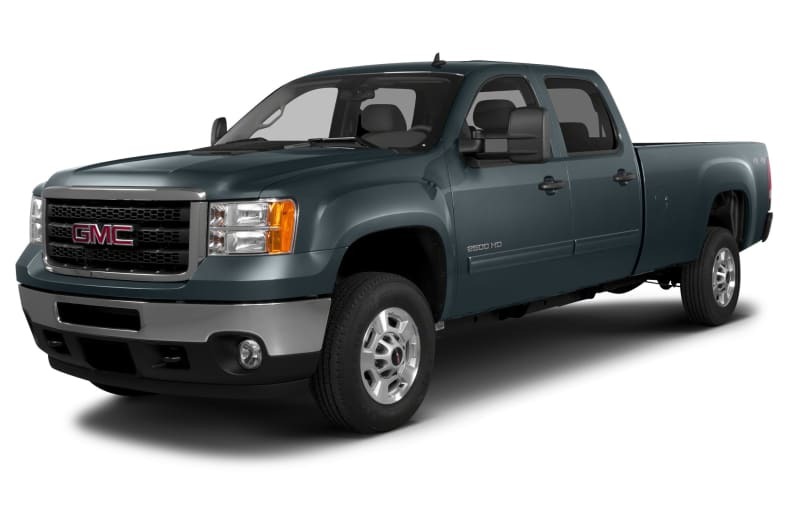 The GMC Sierra 3500 HD is a full-size, heavy duty, "one-ton" pickup truck twin to the Chevy Silverado but features more mature, restrained styling. Like all Sierras, the 3500 HD is available in a wide array of bed sizes, wheelbases, drive types and cab sizes, as well as a variety of trim levels. The GMC Sierra 3500 HD is available in a Work Truck, an SLE, an SLT and a Denali trim with either a single rear-wheel (SRW) or a dual rear-wheel (DRW) configuration. The standard 6.0-liter Vortec V8 engine's new camshaft profile helps the engine produce more torque lower in the rpm band, for improved launch feel and a greater feeling of overall performance when towing a trailer and at higher altitudes. This engine can also be configured to run on E85 when ordered with a Fleetside pickup box. The revised and optional 397-hp/765 lb-ft torque B20 biodiesel-capable Duramax 6.6-liter diesel provides even more towing capabilities and all engines are mated to a 6-speed automatic Allison transmission. The stiff, fully-boxed frame provides durability and improves the overall ride, while supporting increased capability. The torsion bar front suspension allows for a greater front Gross Axle Weight Rating (GAWR). The rear suspension uses wider leaf springs - now asymmetrical to reduce axle hop - that contribute to improved ride and handling characteristics and increased rear GAWR. Large 4-wheel disc brakes deliver smoother, more immediate and confident-feeling performance and diesel engines include an exhaust brake. Stability control, hill start assist and a trailer sway control system are standard on single rear wheel trucks. Available features include mobile WiFi, USB connectivity, rear back-up camera, Bluetooth connectivity, XM satellite radio, OnStar 9.0 and a navigation system. For 2014, the GMC Sierra 3500 HD Truck is carried over from 2013 but with one notable change. The extended cab models are not available for 2014.